Jason says that everyone is telling Alex to put Jessica up but Jason is telling her to “F*” that put up Dominique and Matt or Dom and Christmas. Jason says Elena and Alex’s deal is only good for Elena and Mark. Feed subscription lets you go back and re-watch everything we post here CBS All Access Live Feeds with a FREE 7 DAY trial. Paul says he needs to convince Ramses he didn’t vote for him that is the only person that is suspect. Jessica tells him it was Raven that put Alex’s cat ears under the living room couch. 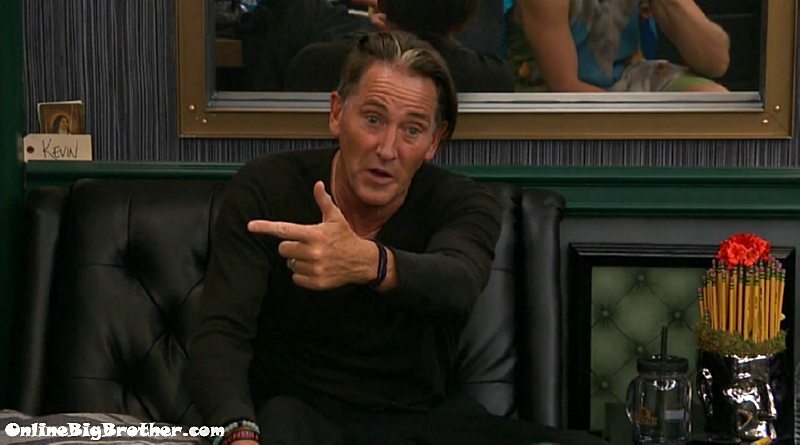 Jason – who do we think we should put on the block.. Raven and Matt..
Jason asks him who he would put up. Ramses doesn’t know..
Rames tells Jessica he feels as alone as she does. Lately everyone has been sketchy around him. Jessica tells him she wants revenge on the other side of the house for voting out her boyfriend. Ramses says he can’t wait to see Raven’s reaction she’s hated Alex since day 2. Raven – Bro it’s in my t1t.. it’s there..
Raven – awwww.. .you guys love me..
Jason says Raven was the person that took Alex’s ears and put them under the couch and she is the one that is dumping the coke. Alex – she is the one that took my ears..
Alex – how do yo know..
Jason – it was Christmas and Raven that voted Ramses tonight..
Jason says it was Jessica that told him. Adds that last night Cody told him they can trust Jessica. Jason believes Jessica. Jason says they have Ramses, Kevin, Jessica, Jason, they can get “dumnb a$$ Josh” if they can get Paul and Mark. Kevin making a big deal that he beat Ramses by 12 minutes in the HOH… They have a laugh..
Jason says they need to find out who Josh would put up. Ramses says Josh So aligned with them he would put Jessica and one of them up. Jason points out that Alex is HOH and the other side is still not hanging out with them. 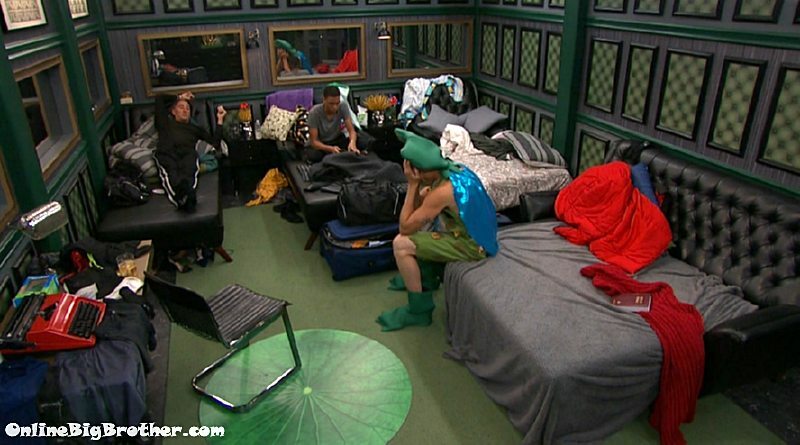 Kevin – and she’s being told what to do..
Kevin says he will talk Christmas and Paul to join them. They got Jason, Kevin, Ramses, Jessica, Alex “The mad man from Miami”. Kevin getting fired up about them taking control of the house from the showmances. Alex tells them they have to get the POV this week. Jason says that competition today was as much mental as physical. Points out that Josh was saying he wouldn’t be the first one off. Adds that Josh voted out Jillian when he told them all he wouldn’t. Jason tells him what makes a man an man are the decisions that move him forwards.. if you say I’m not going to be the first one off You don’t be the first one off..
Jason explains every time he doesn’t do something he says he’ll do it doesn’t affect anybody else but himself. Jason – every time you b1tch out of something you said.. You lose respect for yourself. Then it makes it easier the next time.. you’re hollow..
Jason stresses that the other side is going to tell Josh anything he wants to hear..
Alex tells Jason that Jessica tried to get Alex out week 12 because she thought she was hitting on her boyfriend. Alex tells them they are getting woken up early tomorrow. 8 or 9 . Kevin points out to them that Mark was telling Elena not to take any deals. Josh says he was pissed at Ramses for not throwing the POV. Josh says if Ramses had won the Veto Josh could have gone home. JOsh adds that they all volunteered to go on the block. Ramses says he was going to take one of them off the block. He wasn’t going to use it on himself. Kevin and Jason continue to rally the outsider. Ramses warns that Josh is not on their side. Kevin – trust me he’s a good looking kid but he’s not a social butterfly..
Kevin adds that Cody told him he’s only got 1 friend in Dallas. Keivn again pushing for them to flip the house upside down. Alex says Jessica will run back to the other side..
Ramses says the best thing for them is someone from the other side to go down. Kevin says if Alex puts up Matt and Raven this whole thing is going to collapse. 11:38pm Alex gets called into the Diary room. HOH room time. I’ll do a mini Karken hour this weekend where I’ll explain Andrew. Simon: You had me cracking up all through this recap! Your side comments are just hilarious and right on target. Can’t wait to hear all about Andrew. I would love to see Raven and Matt on the block. 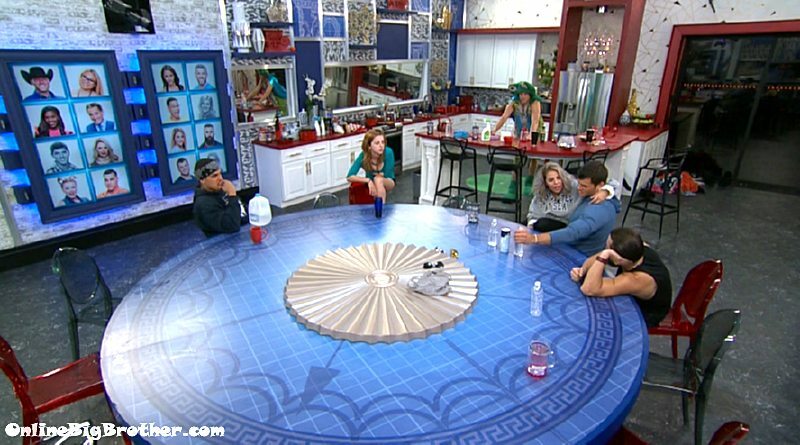 I think Alex know that it was Kevin voted for Ramses and I hope she uses her HOH wisely; and Jason…stfu!!!! Geez I wish Alex wasn’t aligned with the worst BB recruit of all time (Jason). Like seriously!? He’s both clueless and cocky and I can’t wait for Alex to remind him that HE is not the one in power. +Paul Xmas Dom convo is about getting jason out soon. Come on Alex, put up 2 of them. Gotta be a pair. Matt/Raven, Mark/Dom/Elena (because we all know that’s a ménage a blow up doll). Break that stuff up! Do it! Do it ! Do it! Kevin steal the show on BBAD. I knew there was a pre jury buy back cz I noticed there were no good bye messages, or were there? Don’t remember any so far. Is it just me or is Mark treating Elena different now? This comp definitely boost Elena’s confidence, she however sounds stupid asking protection for half the house. So you want the girl to nominate her people to honor your deal, LOL. The “cool kids” sure are untitled. Jason is horrible. He’s a bully and cocky, which I don’t know why as he’s done nothing in this game. I would love to see Alex put up Christmas and Mark. I wish she would put Jason up as he’s trying in his own way to bully her to do what he wants. Josh is another i want to see go. She has to hold up her droopy melons and fish lips…. Hi family… I’m not always around – you know already how I can’t watch live feeds and choose to be “surprised” by the CBS episodes – but whenever I visit OBB, I make sure to click on the adds to help the great Simon. I hope y’all are doing the same. Here some thoughts about last episode: I totally think that Grodner brought the Battle Back back last minute. I feel that even though she and production knew they had to protect Paul, they weren’t expecting all the drama that went down in the first weeks or that Cody would turn out to be the only player with some backbone. No, I’m not saying that Alex and few others in there are lame, but the big group is pretty much useless (more on that soon). I feel this way because Julie NEVER mentioned the Battle Back to any of the previous evictees like she used to do last summer. Do you think I’m right or wrong? Either way, I’m happy that Cody gets to come back… let’s face it: it will be mostly endurance comps and he will beat everyone. I just didn’t understand what’s up with that “houseguests may stop the Battle Back winner from entering the house.” What’s the point? If they can veto the return, why bother? It’s kind of obvious they would block most returnees. And just to talk a little more about Cody, it’s funny how he turned into someone way chattier and warm during the interview. He confessed he hated the Den of Temptation and I was like: dude, you need to learn and accept games that have a variable element of surprise. And still got this impression that he sees his BB opponents as members of the Taliban and not as simple players! LOL! Dude, what the hell? As for the interview, I also noticed ALL THE CLUES production fed him through Julie: step up your social game / rethink your strategies / play a little different. I hope that he absorbs some of it. I don’t want him to win… his behavior when Xmas was announcing her surgery was plain nasty… but please, we need real competitors in that house. His description about how the house behaves around Paul was awesome and cracked me up. So on point. Most in there are just a bunch of followers (right, Matt?). Since I brought that up: am I the only one who truly despises Matt? Honestly, I have nothing against the guy on a personal level but in the show he bugs the patience out of me! His performances in the comps are always pitiful. 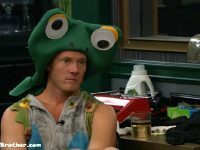 What was Matt in both veto comps he played? Total loser. He makes me feel lazy… I can’t explain… it’s like: dude, the salt n pepper is not only on your hair… it’s in your spirit! He behaves like a tired old man blended with spoiled brat who expects things will just fall on his lap. Lay down and die already! 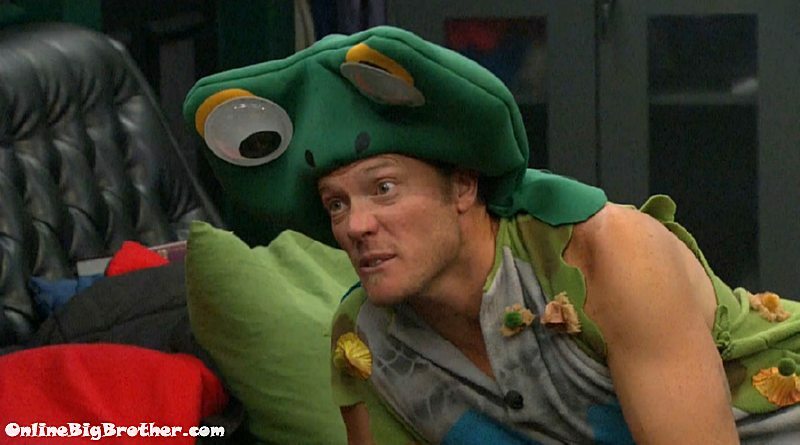 I’m not a single bit surprised that neither him or Mark are HOH this week. Kevin is playing a good game. That’s what I call putting little effort but causing havoc. 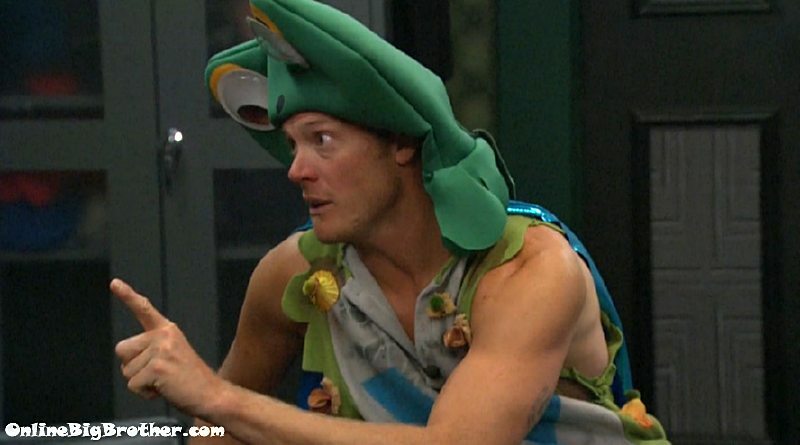 Does Cody still think that Kevin voted to evict Christmas? Hi ROXT! I think you are spot on. From reading the updates, it seem that Alex is following orders from Paul, making it a boring week. Are we not wishing for a buyback win from Cody and have a round 3 battle with Paul? Or Cody versus Josh? Or Cody versus Mark? 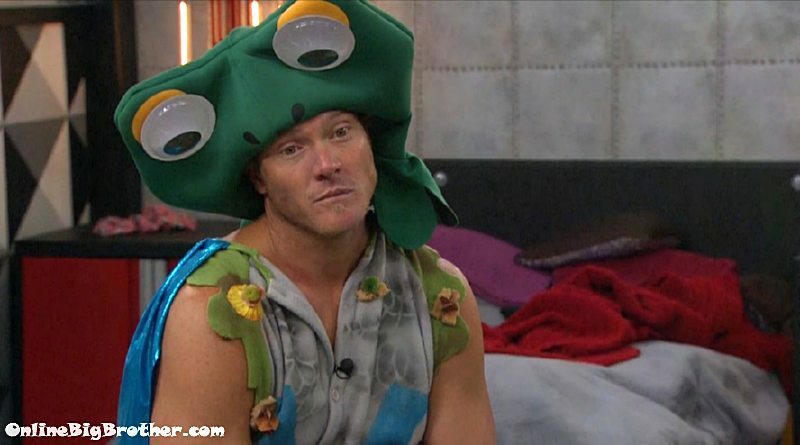 Add in the unpredictable Jason, this season of Big Brother is far from over. Ha ha ha, Elena thinks she might get the temptation because Paul did a funny DR about her so his fans will see that he likes her, what’s wrong with this people? She’s wondering why she hasn’t been called to the DR to discuss her big game move of throwing the HOH to Alex. She might ask for a red carpet to the DR. Also Hate when people say it’s your HOH but make a whole bunch of demands. The braintrust surrounding Alex sure is playing fast and loose with her HOH. You would think they won the comp. No wonder Alex wants to work with the other side, at least they can assemble what passes for a brain. Unfortunately she’s saddled with a crew of morons who can’t see past the next minute.. So what would you have her do? Put up Jessica and Ramses, as Paul and the showmances want her to do? Tell me how does that help Alex’s game going foward? Those are two of the people she could possibly work with (and VOTE with) to take down the strong seven (Paul, Xmas, Mark, Elena, Matt, Raven and Dom). If she starts eliminating her own numbers, it will be just that much harder to round up the votes to take down the bigger group! Yeah, it could put her in some danger to put up Matt and Raven, or Mark and Dom, or even Josh and Xmas, but IMHO it’s time to let that side know they aren’t on vacation and that somebody is not afraid to take a shot at their group, with the result being at least one of their numbers goes home (or at least to the battle back). If Cody wins the Battle Back and the producers don’t screw him over again, they will add another number to their side (granted they don’t know that yet) for a net gain of 2 by the end of next week. I think Jason’s got the right idea, and maybe he needs to just cool his jets a little bit and talk logically to Alex about it to help her see it makes sense. She said up above that “she “ain’t” scared.”, then DON’T PLAY SCARED. Take the shot, move em out, and if they come back at ya, rely on your athletic ability to take yourself off the block. YOU ARE THE ALPHA ALEX! STICK IT TO THEM!!! I wonder if they have the house guests tape good bye messages. If not that would be a huge clue someone’s coming back. Of course you don’t need a ton of clues because they’ve brought folks back for the last few seasons. Has anyone been voted out more than Victor in any combination of seasons? Since Julie said the house guests can stop the returning house guest, do you think that if the halting hex is used that the battle back winner will not get to enter the house? But we also need Christmas to use her power to take someone off the block – so she needs to be nominated so that she uses it on herself and Alex can back door someone. JASON & KEVIN are the best tonight! Looks like Dom and Jessica are going on the block and if one gets the veto possible replacement nominee is Christmas or Mark. Alex has a reason to put up just about everyone in the house. She needs to do what’s best for her game and for her longevity in the house. Not for Jason’s or whoever else’s game. She should send out one of the couples and break them up, because if Cody gets back in the game there will be all couples again and that would surely sting for all the people playing solo. Agh, I can’t wait for Raven the clown to leave.